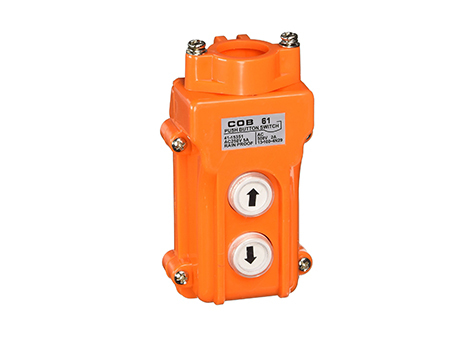 COB Pushbutton switch is suitable in circuit of AC50 or 60Hz, rated voltageupto 500V, rated current up to 5A for controlling start and stop of remote motor. It is widely used in machine tool, textile machinery, etc. There are five specifications in this series: 2 lines, 4 lines, 6 lines, 8 lines, 10 lines. 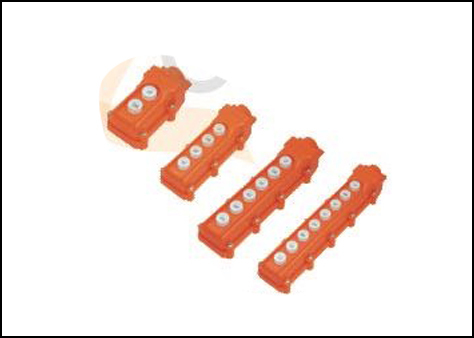 Below are the available COB with their model no and features:COB 61 - Up, Down COB 61A - On, Off, Up, Down COB 62 - Up, Down, Left, Right COB 62A - On, Off, Up, Down, Left, Right COB 63 - Up, Down, Left, Right, Front, Back COB 63A - On, Off, Up, Down, Left, Right, Front, Back COB 64 - Up, Down, Left, Right, Front, Back, Anti Clockwise, Clockwise COB 64A - On, Off, Up, Down, Left, Right, Front, Back, Anti Clockwise, Clockwise.